Although Jordan is small in size, the list of historic sites, adventurous activities, and cultural experiences within its borders is endless. Whether you plan to see all the classic highlights or take the road less traveled, you can fit a lot into one trip if you have more than a week to spend. These inspiring 10-day itineraries will take you through Jordan from north to south, and even across the border to Israel - all you have left to do is pack a suitcase. If you’re keen to check some big items off your bucket list, this itinerary is your best bet. Spend your first two days exploring the lively capital city of Amman. Be sure to wander the Balad — old downtown’s beating heart, dotted with souvenir and spice shops, markets, and more — and sample falafel from local favorite Hashem’s Restaurant. Head up to Jabal al-Qal'a (Citadel Hill) where you’ll find ancient ruins, the iconic Temple of Hercules, Umayyad Palace, and endless photo ops. 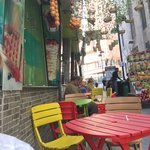 Grab a tea, coffee, or shisha with a view at one of the cozy cafés and restaurants on and around Rainbow Street. Catch the sunset and happy hour from one of the many rooftop restaurants. After two days of urban exploration, you’ll be ready to relax. You can drive directly to the Dead Sea in less than an hour from Amman. Or, if you prefer the scenic route, take a road trip through Madaba (you can find more great road trip ideas here). Today and tomorrow are reserved for R&R — book a spa treatment, lounge by the pool, and spend some time just soaking in the salty sea. 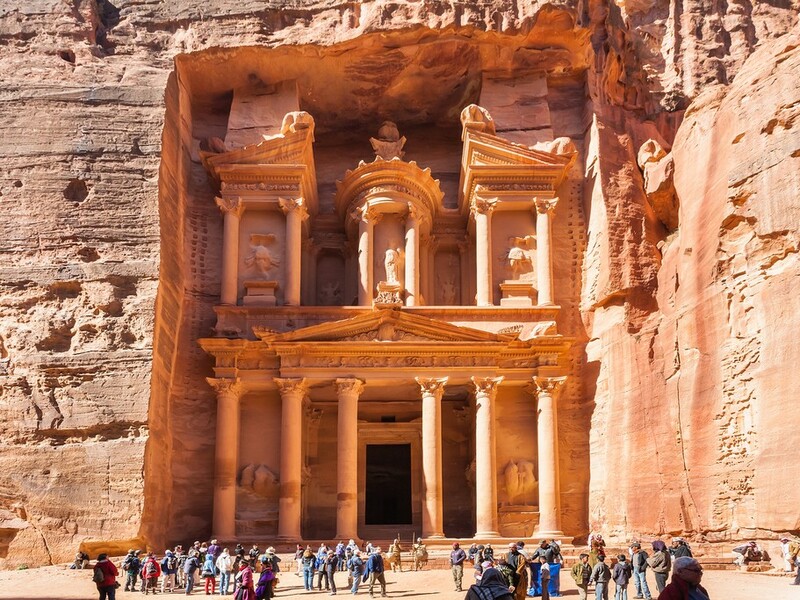 Exploring the architectural wonders of Petra is a must for most anyone visiting Jordan, so that’s your next stop. Petra is expansive and you’ll need at least one full day to trek through the ruins and visit some of the main sites. Book a nearby Bedouin camp where you can stretch out and wind down by the campfire after a long day of discovery. A greatest hits trip isn’t complete without an overnight in the majestic Valley of the Moon. Spend a day strolling the sand dunes and marveling at the massive rock formations in Wadi Rum, then spend the evening sipping sweet Bedouin tea and spotting shooting stars in the endless sky. The refreshing waters of the Red Sea are less than an hour away at the Gulf of Aqaba, offering a myriad of marine activities — including swimming, snorkeling, diving, and sunset sailing — to wrap up your Jordan adventure. If you seek unique cultural and immersive experiences, you’ll find them further off the main tourist trails. 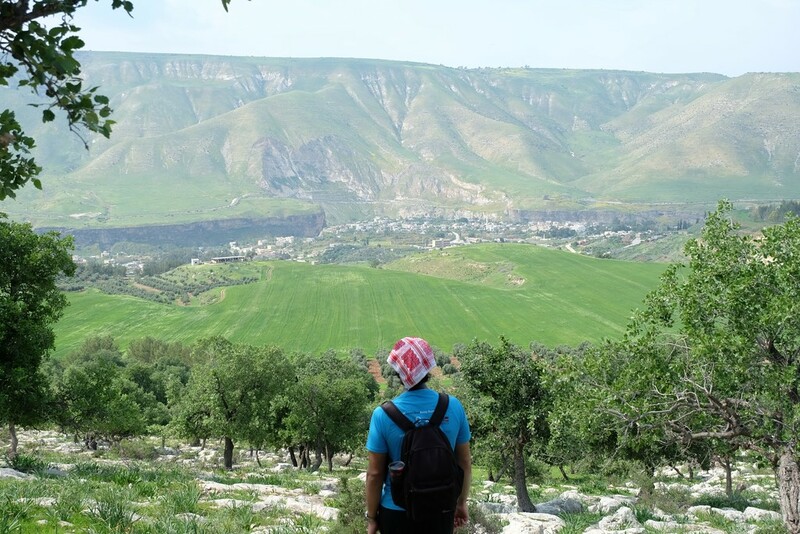 Spend your first two days in Um Qais and get a true feel for local life, with activities such as beekeeping, foraging, basket weaving, and hiking in the Yarmouk Nature Reserve — all led by local experts. Enjoy a hearty home-cooked Jordanian meal in a family’s house, or opt to cook the meal yourself with the guidance of a local chef and an abundance of fresh, locally-sourced ingredients. Don’t miss the chance to check out the Greco-Roman ruins of Gadara, best enjoyed when explored alongside a local guide that can provide a deeper understanding of the history and culture of the area. Continue on the road less traveled, and head south to Ajloun. Enjoy countryside views from Ajloun Castle, then take a hike — and spend the night — in the shade of the Ajloun Forest Reserve. Cozy Ajloun Cabins offer a peaceful night’s rest and a chance to get closer to the lesser known flora and fauna found in northern Jordan. Or opt for an evening in a local family home in Orjan. 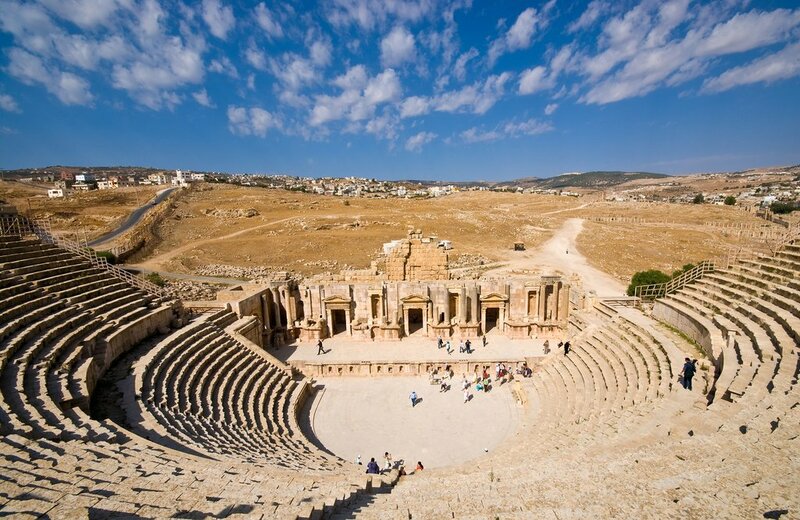 Ask our specialists to check local event schedules — nearby Jerash often hosts concerts inside the Roman ruins. Whether or not you attend an evening event in Jerash, save some daylight hours on day four to explore all this stunning well-preserved archaeological site has to offer. In the afternoon, you’ll be off to your next destination: a secluded spot on the Dead Sea. While most travelers stay in the multi-story hotels along the beach, Mujib Chalets is a delightful, eco-friendly alternative. The simple design lets the natural beauty of the Dead Sea shine, and guests of the Chalets have private access to their own secluded area to soak in the soothing waters or cozy up and sip tea by the campfire. You can’t leave Jordan without exploring at least one wadi. Your next stop — Wadi Bin Hammad — is one of Jordan’s hidden hiking gems. You’ll walk through the warm waters that run along the bottom, passing palm trees and hanging gardens, and maybe catching sight of orchids, crabs, frogs, and other species found in this special microclimate. If you’re interested in crusader castles, Kerak Castle is about an hour’s drive from Wadi Bin Hammad. Or you can hit the road and head straight to your final destination: Feynan Ecolodge. This eco and culturally-conscious lodge offers a selection of experiential activities that will help you better understand the land, people, and culture of the country. Trek through the Dana Biosphere Reserve, cook alongside a local chef or spend the day with a Bedouin shepherd. Whatever you choose, you are sure to enjoy these immersive experiences, far from the noise of the cities and the rush of the crowds. Make the most of your time in the Middle East with a multi-country itinerary. Get a good intro to Jordan with a couple of days in Amman — nibbling your way through downtown, climbing up to enjoy the city views from the Roman Theater, and strolling around Citadel Hill at sunset — before continuing on to Petra, a UNESCO World Heritage Site that boasts impressive architecture, ancient stories, and labyrinthine trails. Allow yourself at a day or two to wander the ruins of the Lost City, and if you prefer to avoid the crowds, consider entering Petra via “The Backdoor” — another one of Jordan's hidden hiking gems. Check out the Ultimate Guide to Visiting Petra for more tips and suggestions, like nighttime visits by candlelight. Continue south and take a jeep tour of Wadi Rum, scale some rocks at Jebel Burdah - featured here as one of the country's best treks - and sleep under the stars in a “bubble tent.” When you’re ready to leave the sand dunes behind, escape north for an overnight stay at the Dead Sea. Float your cares away in the therapeutic mineral waters, best enjoyed by the pink light of sunrise or sunset. Cross the Allenby Bridge into the Palestinian Territories and make your way to Bethlehem - read this handy how-to guide with information and tips for crossing the border. 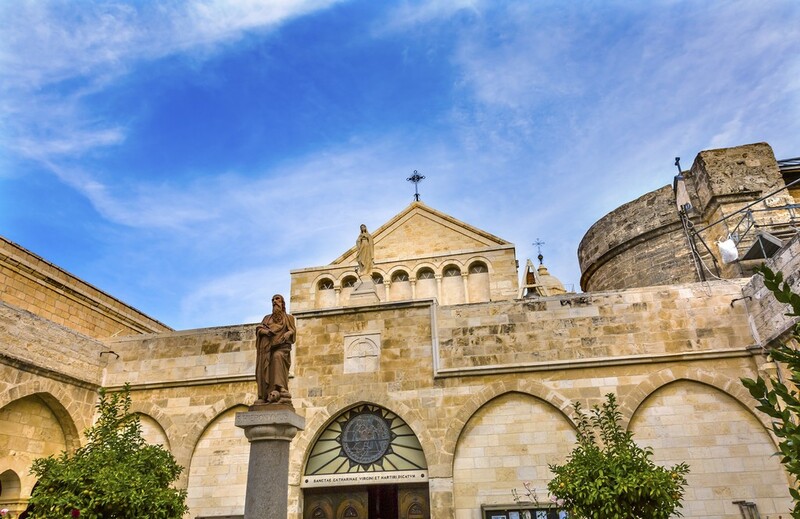 After crossing the border, be sure to stop by the Church of the Nativity — a site that celebrates the birthplace of Jesus. You’ll have a couple of days to explore, so check out our highlights of Jordan and Israel itinerary for some inspiration on other sights to see in Israel and the Palestinian Territories. On your final day, you'll re-enter Jordan the same way you came, over the Allenby Bridge, and return to Amman for your departure flight.